Rivers and stream systems evolve together with and in response to changes in the surrounding ecosystem. They are dynamic systems that continuously adjust within specified boundaries to natural variations in flow rates, sediment load, temperature and other variables. When land use change or other disturbances cause these variables to fluctuate outside of their natural ranges, the stream system is forced to establish a new equilibrium. This process may take several decades and contribute to aquatic habitat degradation and loss of other beneficial uses of the stream or stream corridor. The practice of restoration attempts to re-establish the structure, function and self-sustaining nature of stream ecosystems. The first step to accomplishing this task typically involves halting or altering activities preventing the stream from re-establishing a dynamic equilibrium with the surrounding environment. Once this goal has been accomplished, restoration activities within the stream corridor or stream itself can be initiated with greater chance of success. Natural Channel Design is one example of a stream restoration practice that has become increasingly popular over the past fifteen years. 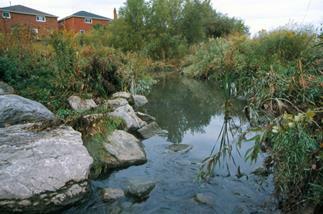 To learn more about this approach to stream restoration, click here.